Acquisition strategy has been in the news this week. Apple CFO Luca Maestri was asked at a Goldman Sachs conference about how the company might use its cash in the wake of a repatriation tax holiday. He downplayed the potential for acquisitions while reiterating Tim Cook’s point that Apple doesn’t reject deals on the basis of being over a certain price point. There’s also been reporting this week about Apple’s negotiating strategy during acquisition talks hurting its ability to close big deals. In that context, it’s worth looking at the history of consumer tech acquisitions and how they’ve fared. As you can see, there’s a big range here with Microsoft coming out on top, in terms of total value of the deals, and Facebook coming out on top with highest average deal size (heavily affected by its $19 billion WhatsApp acquisition). Among the larger companies, Apple and Amazon have done the smallest total value of deals over $100 million, while Twitter’s total is quite a bit less. 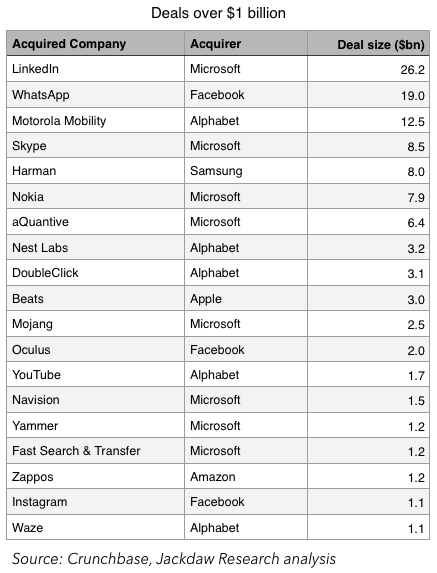 Microsoft is most represented on this list, in part by virtue of being one of the longest-standing companies in the group, but also because it seems particularly willing to do these billion-plus deals relative to others. It has eight out of the 19 deals shown with Alphabet second at five. Apple only has one entry on the list (Beats at $3 billion) and Samsung also has just the one, with its recently announced Harman deal at $8 billion. Solid successes – I’d say this group includes Beats, on the basis of the solid success of Apple Music (but also part of the declining accessories business at Apple), Fast Search and Transfer at Microsoft (now Microsoft Development Center Norway), Waze, and Navision (although it could be argued it belongs in the big success bucket as a foundational piece of Dynamics). Many of the rest of the deals are too early in their tenure at their new homes to be certain how these acquisitions will fare long term. The LinkedIn deal just barely closed, while the WhatsApp deal has been closed for some time but Facebook hasn’t really turned on monetization for it yet so it’s hard to tell whether that will ever pay off. To me, it looks like the smartest companies in this group understand this and are very discerning about the acquisitions they make. In some cases, that probably means looking at a lot of deals they eventually pass on and, in other cases, it means losing out to companies willing to move faster on due diligence. But that’s the price you pay for a careful acquisition strategy intended to protect a corporate culture rather than bring change at any cost.